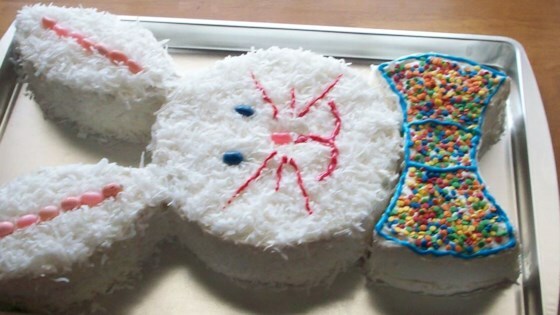 "A simple version of a coconut white cake shaped like a bunny head! " I've been making this cake for years. I use white cake mix and cream cheese frosting. I also color some of the coconut pink for the ears and green for grass (I put around the cake). One of the cutest cakes ever! I mixed it up a bit and used chocolate frosting and M&M's to decorate. Looked great and tasted great too! I make this cake every year. This is a great hit with the kids. I like to use banana cake with banana frosting to give it a different flavor.